After graduation he enlisted in the Union Home Guards of Missouri, but saw no active service beyond the state boundaries. Then for two years he had charge of a Mission House connected with his father’s church, working among the poor of St. Louis, and meanwhile preparing for the ministry under his father’s guidance. He next entered the Harvard Divinity School and graduated in 1865, doing two years’ work in one, in spite of such defective eyesight that it was often necessary to have his books read to him. The next year he took the degree of Master of Arts from Washington University. He preached for a time in Louisville, Kentucky, and supplied the Church of the Messiah in New Orleans for two periods of several weeks each. On November 28, 1865, he married Henrietta Robins Mack of St. Louis, who was also descended from the finest New England stock. This fortunate and happy union was unbroken for sixty-seven years, and Mrs. Eliot always actively shared her husband’s work. Meanwhile plans were afoot for the establishment of a Unitarian Church in Portland, Oregon. In July, 1862, Starr King had preached there the first liberal sermon in the Northwest. In December, 1865, a group of women formed a “Ladies Sewing Society” to earn money for a church. Their first thirty dollars they sent to Rev. Horatio Stebbins, Starr King’s successor who had recently arrived in San Francisco, to buy a communion service. The San Francisco church lent Horatio Stebbins to Portland for three weeks in April, 1866; a society was organized, subscriptions were started, and a lot of land, between the town and forest, was bought for $2,000. Then, in the summer of 1867, a little chapel was built. Finally, through the agency of Rev. Charles Lowe of the American Unitarian Association, an invitation was sent to Thomas Eliot to be their minister. The letter reached him in the same mail with one from Portland, Maine, which was in effect a call to the First Parish of that city, which Horatio Stebbins had left to go to San Francisco. And almost immediately came an invitation to settle in New Orleans. Characteristically Mr. Eliot followed his father’s example and of the three opportunities chose the call to the frontier post which seemingly had least to offer. He went with his young wife and baby by way of Panama to San Francisco, and thence by steamer to Portland, arriving at his new home on the morning of December 24, 1867. The baby slept that night, and for some months thereafter, in a leather trunk. The following Sunday, December 29, 1867, the new chapel was dedicated and the young minister began his work. Portland at that time was a remote, pioneer town of some six thousand inhabitants. The streets were deep in mud or dust, according to the weather, and without lights or sidewalks. No railroad had as yet reached the town. Travelers came by an overland coach which continued up the Coast from California, or by one of the steamers which arrived two or three times a month. Letters by “pony express” to the Eliot home in St. Louis were two months on the way. But the men and women who had settled Portland were an exceptionally vigorous and capable pioneer group, and they were prepared to build one of the most stable and orderly communities on the Coast. Thomas Eliot was promptly dubbed “the boy preacher” because of his youthful appearance. He at once began to build up his church, which soon became and has always remained strong and influential. He preached as opportunity offered at the County Farm, the County Jail and the Insane Asylum, his early training having made him a friend to the wretched and distressed. He also worked for legislation to establish a State Board of Charities and Correction, and it was said of him that for years he was almost the only person in Oregon interested in prison reform. From 1872 to 1875 he was County Superintendent of Education, having been nominated by both political parties. The post involved much travel under arduous conditions, but he turned into the church treasury the salary which he received for his services. By 1875 the church had so increased that a larger building was needed, and a fund was started and plans were secured from the Boston architects, Peabody and Stearns. Thomas Eliot, although he came of long-lived stock, was never physically vigorous, and after the injury to his eyes, he could not read or write for more than a quarter of an hour without pain. For years Mrs. Eliot served as his amanuensis to whom he dictated his sermons, a fact which gave rise to the legend that she wrote his sermons for him. In 1875 he was worn and weary from his pioneer labors. So he resigned. But the church refused to accept his resignation, granting him instead a year’s leave of absence to be spent in Europe, which he accepted, recalling his father’s advice, “Do not change; stick to your post, and let your influence become cumulative.” He carried with him an appointment as Commissioner of Prisons for Oregon, to facilitate his study of European prison methods. He returned much improved in health, and not long afterwards the money needed for the new church building was in hand, and it was dedicated in July, 1879. It was “Victorian Gothic” in style, and adjoined the original chapel. It served the parish until 1923, when the site which had cost $2,000 in 1867 was sold for $200,000 and the present noble church was built not many blocks away. Dr. Eliot continued as active minister of the church until 1893, though after 1890 Rev. 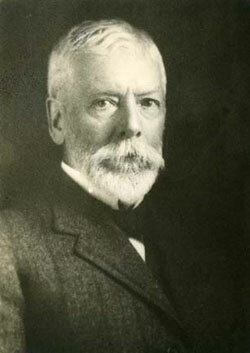 Earl M. Wilbur, who married Dr. Eliot’s eldest daughter, Dorothea, and who was later president of the Pacific Unitarian School for the Ministry, was his associate. During his active ministry, until the coming of his associate, he preached twice each Sunday, and he was an assiduous pastor. Nevertheless, although he said, “I am jealous of the time I have to give to tasks other than church tasks,” his activities were always overflowing into numerous other channels of community service. Indeed, for fifty years there was hardly a movement for civic betterment in which he did not take a leading part. He was president of the Children’s Home from 1875–1919; of the Oregon Humane Society from 1882–1900; of the Oregon Conference of Charities and Correction from 1902–1912; trustee of the Boys’ and Girls’ Aid Society from 1885–1921; and of the Portland Associated Charities from 1905 to 1908. He was a vice-president and director of the Art Association from 1882–1917, and of the Library Association from 1897–1907, and he served on the Park Commission from 1900–1906. His church was a fountain of influence and of money for constructive enterprises, and from two of its members—husband and wife—came the endowment of Reed Institute and the establishment of Reed College, which Dr. Eliot organized and, at the request of the founders, served as the president of the Board of Trustees from 1904 to 1920. In this, as in many other lines, to an extraordinary degree he reproduced in Portland the earlier work of his distinguished father in St. Louis. He was also a member of the board of directors of the American Unitarian Association from 1894–1900; Commissioner to Japan from the Association in 1903; and a trustee of the Pacific Unitarian School at Berkeley from 1907 to 1918. Few ministers have had so long, so happy and so honorable a career. He was, in truth, “a citizen minister.” He saw the city of his adoption grow from a small frontier town to a handsome, well-ordered city of more than three hundred thousand people, and no other single individual contributed so much as he to the higher life of the community, and perhaps none loved it more. And he loved not only the city, but the glorious land in which it is set. He early built a summer home at Hood River, and witnessed the transformation of that noble valley from a forest wilderness to a vast apple orchard. The Eliot glacier on Mt. Hood is named for him. In person Dr. Eliot was a man of exceptional charm and of winning courtesy, of scholarly tastes and poetic temperament, modest and retiring but sturdy and courageous in his convictions, a lover of mankind. While he was still a young man Dr. Horatio Stebbins said he was the wisest man he knew. In 1889 Harvard gave him the honorary degree of Doctor of Divinity in absentia; in 1912 Washington University made him an honorary Doctor of Laws; and in 1915 Reed College conferred on him the degree of Doctor of Letters. Eight children were born to Dr. and Mrs. Eliot. His eldest son, Rev. William G. Eliot, Jr., succeeded to his father’s pulpit in 1906, when Dr. Eliot became minister emeritus. In 1934 the son in turn became minister emeritus. The Portland church is probably unique in having both a father and a son carried on its rolls as living pastors emeriti.